As of April 2017, McCormick has discontinued this product. 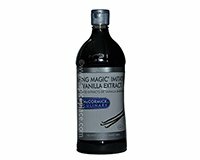 The recommended replacement is McCormick Imitation Vanilla Flavor 32oz, which may require adjustments to your recipes since it's a 1-fold concentration. Also McCormick no longer packages extracts and flavors in gallon sizes. Melt butter and carefully pour off clear portion of butter into a small bowl to make clarified butter. Recipe yields 3/4 cup of Vanilla Sauce. Made in USA by and Baking Magic® is a registered trademark of McCormick and Company, Inc., Hunt Valley, MD 21031.